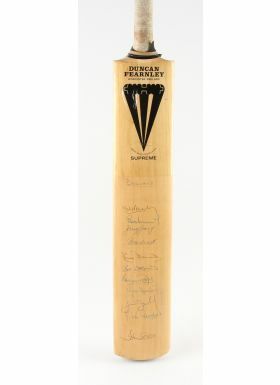 c.1970’s England Signed Cricket Bat Duncan Fearnley signed England bat with 11 signatures including Brearley, Willis, Greig, Knott, Underwood, Boycott, Randall and others. Rubber grip to handle missing. From the personal collection of Bernard Thomas, who was the physiotherapist for the England team between 1970 and 1985.